Here we are in Week 4 and the children are settling well into the rhythm of school again. Wonderful sounds are emanating from the ensemble groups and the buzz of learning is evident in all the classrooms. Yesterday we had a lovely get together in the staff room for the class carers, admin and teaching staff, it was just a chance to have an informal chat and put names to faces. Thanks to our wonderful P &F team for providing the wonderful refreshments. Pancake Day was lovely again this year so thanks once again to everyone for coming along and providing some delicious treats. Sitting down, sharing food with a chance to catch up is such an easy, relaxed thing to do. Our P&F really provide a warm and welcoming environment for our community. The Board met last night for the first time this year and welcomed Warwick Smith as our newest member. The Board meets once a month for a couple of hours and reviews the reports provided by Neil and myself on the financial and educational operations of the school. The Board as the Governance instrument of the school has the responsibility to ensure compliance in all areas the school’s business and to assess any risk. It is looking like a busy year ahead as we focus on Strategic Planning, so look forward to offering your thoughts at some stage as we canvas your hopes and aspirations. Thanks to everyone who contributed to making last week’s Shrove Tuesday breakfast such a lovely morning. Coming so early in the term, its a perfect opportunity to catch up with old friends in the morning sunshine. Last week we also had our first class carer meeting for the year. Class carers meet a couple of times a year to share ideas and information. Yesterday the school hosted an afternoon tea in the staff room for class carers to meet with teachers and staff. This was a great way to get to know the people who work around the school – a process that can sometimes take years! 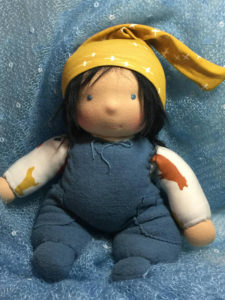 We’re still looking for a few participants for our Doll making course on Saturday, 10 March with talented American doll maker Mary Hirsch-Jones. Or contact me for more information. With the crayon rolls for class one finished, craft group is moving on to birthday crowns. In this lovely tradition, a special crown is worn by the birthday child to identify them as the focus of our celebrating. Join us on Wednesday, 28 February and/or 7 March between 9 and noon to create an individualised felt crown for your child. No prior sewing or crafting skills needed. $5 for materials. The following two Wednesdays, we’ll be crafting personalised strings of bunting, perhaps to hang in your child’s room. 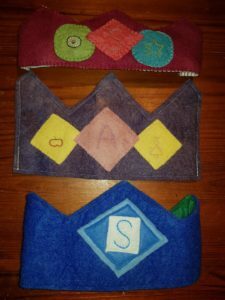 The letters of their name or images on the bunting will be needle-felted. This will be a gentle introduction to this beautiful but easy and very forgiving crafting technique. There will be a small charge for the felt backing or you are welcome to bring your own if you have something suitable. The final Wednesday of term, we’ll be needle-felting little chicks for Easter displays. Contact Aleesha on 0421 845 757 for more information. First round offers are almost complete for 2019. If you are an existing family within the school and we have not been in contact with you, please get in touch with Rachael to ensure that your child is guaranteed a place. Numbers are very healthy for all future years, so its good to also ensure we have all younger sibling information in the system. There are places available on the bus, please contact Ken for further information. A Warm Welcome back to all Playgroup families for 2018. I hope you all have had a restful, restorative break and are settling back into the rhythm of our beloved playgroup and community. Over the last few weeks it has been exciting to see how all the children have grown over the holidays and their play has been enthusiastic and lively. We have been enjoying lots of water play in the sandpit with wooden boats and our garden has been lovingly tendered and watered back to life with our little watering cans. We have been making fairy houses with collected treasures found on the beach and in the bush and threading beads, shells, feathers and driftwood into beautiful wind hangings. This term Playgroup introduces a new group on a Wednesday afternoon for 10 new families. We look forward to welcoming you all into our community. Collectively, we now have 5 playgroups with approximately 60 children attending our program. This is exciting news for our school!! Thankyou to everyone for bringing along your garden produce to share with others on our fruit plates. We have been very spoilt with home grown figs, grapes, peaches and plums. Thankyou to Arrow, Rodney and Mickey for sharing your bumper crop of zucchinis and silver beet. We are all learning to make zucchini soup!! In morning circle we have been sailing in our boats visiting the rainbow fish and butterfly’s. In story our beach gnome and his best friend Matilda Pelican have been visiting the mermaid with the blue hair. We have been stitching fish in craft and sharing all our holiday adventures and exciting news. Over the holidays we also welcomed two new babies into our community. A very warm welcome and congratulations to Akash, Miranda and Shivani on the safe arrival of Narayan. Also to Damien, Renee and Aisha a new baby boy Eli. Both babies bonny and beautiful. Thankyou to the community for organising meal trees in the early weeks for these families. 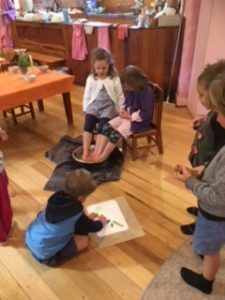 What a busy time we are having in Kinder: foot baths, sharing our news about frogs with our friends and much much more!! Thank you for your recent support with attending the parent evening. 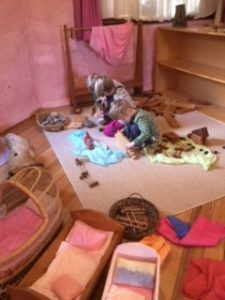 All our lovely Prep’s are settling in well and continuing to enjoy playing in the sand pit and the rhythms of Prep life. Looking forward to seeing you all at tonight’s Class meeting. Everyone is settling in well and really enjoying beginning to learn our letters. 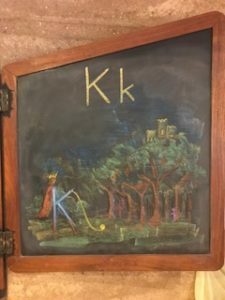 This week we have discovered the letter “K” for King! Class 2 are almost at the end of their first Main Lesson for the term. We’ve been hearing stories from many a distant and near land, such as Canada, North America, Sri Lanka, Papua New Guinea and New Zealand (Maori). We’ve also learnt a song from Sri Lanka about a little golden butterfly who drinks nectar from a rose and we’ve just begun a Maori song, which uses clapping sticks that can also be thrown rhythmically to a partner. It is said that this song and the sticks were used to train the Maori warriors to catch the spears of their opponents in battle. We acknowledged the Chinese New Year last Friday and began making special fans in the style of some of beautiful Chinese ones. It is so lovely to see the children after their summer holidays. They have all grown taller and seem more bold and brave to take on the challenges of our Class Four Norse year. We enjoyed our first Class Four lunch this week (Tuesday) prepared by Lisa and our first four chefs. Tuesday’s are turning into quite a day with Ensemble and Music Lessons and Rock and Water with Mark. In class we are hearing the stories of how the nine Norse worlds began through burning ice and biting flame. Thank you to everyone who was able to attend last weeks class meeting. I hope the session was informative and not too overwhelming. As Class 5 is such a big journey through the Epochs there is a lot of ground to cover. We have begun our new Main Lesson this week “Ancient India.” We have listened to the creation story of how Manu and his people needed to flee Atlantis and journey in an ark for many, many months to their new land of India. Here the people had to learn a new way of life, learn to work with the different climate of the Hot, wet and cool seasons and follow the teachings of Brahma, Vishnu and Shiva. I hope you have enjoyed looking through your child’s previous Main Lesson book of “The World and Mathematics and Geometry.’ Please remember that your child needs to return their book to school completed by Monday. Our Class Eight students are settling beautifully into their new role as senior students of the school. They are doing a great job of welcoming families to Assembly with the Welcome to Country, ​assisting with organising the room and made a fine sight accompanying the Class One students to Assembly for their first time. They have also settled well into the demands of Class Eight in the classroom. They have already presented their early ideas for the Class Eight Major Projects – an exciting goal to aim for at the end of first semester. Whether sharing activities with Class Seven or working on their Main Lesson topic of the Renaissance, they are approaching the year with positivity and enthusiasm. I think most students – both French and otherwise – would agree that the highlight of the last two weeks was the wonderful Pancake Tuesday morning facilitated by the Parents and Friends group. It was lovely to see families enjoying their crepes in the sunshine! Not to be outdone, our Class Six, Seven and Eight French students continued the theme of Mardi Gras (or Fat Tuesday) by translating a simple recipe for les crepes francaises and by making their own masks for carnevale, decorated with feathers and small gold stars. They made a very colourful display! In addition, Class Six have been learning les numeros from one to twelve and playing the number game Onze, while Class Seven and Eight are revising their knowledge of bodyparts with an amusing song, Chez le docteur. As the Craft teacher it has been an incredibly busy time and balancing all the projects feels, at times, as if I am ‘herding cats’. But now that the dust has settled, and all projects are underway, I am able to fully appreciate the amazing curriculum the Craft program follows, and can witness how each project meets the children’s needs, tapping into the Feeling, Willing, Thinking realms of the children. Another way of seeing this is how the Craft Program, nourishes the head, heart and hands of the children. Throughout the year, especially in the senior classes, I will ask the children to carry out some homework. This will consist of researching, on a computer at home, artists/art movements /drawings/ images they like, and to bring to class the printed images they have researched. If this is difficult or if there is no computer/printer at home, please let me know. I am happy to help in any way I can. In the past children have bought in their USB sticks to class and I have printed what they have chosen at school. I hope the children are enjoying their craft classes. If you have any concerns, please let me know. You can discuss your concerns with your Class teacher and they can pass it on or leave a message at the office and I will contact you. An extra big hello and welcome to the Class 1 families. Restorative Practices is core to how we work at CSSK with children, families and staff. Restorative Practices places relationships at the centre of what we do. When there is conflict or something has gone “wrong”, we explore how that is for each individual, reflect on who has been affected or impacted and how. This approach has a no blame attitude at its centre. In a space where the effects and impacts are understood, empathy- understanding the experience of others- becomes more possible. Understanding how relationships have been damaged by conflict or what has happened- the final step is to repair or fix the harm. In practice this approach can be more challenging for individuals who have caused harm, as it requires them to hear and understand the impact they have had- and to hear this directly from the person who has been hurt. And when successful, the result is to restore the environment to one of nurture and safety. Depending on the situation, we do this with individuals, pairs, small groups and whole class groups. In July last year, I conducted a full day’s training with staff at CSSK around Restorative Practices. Since, part of my job role has been to coordinate the ongoing implementation of Restorative Practices at the school. Two weeks ago, I met with class teachers to share and discuss and review how things were going, and what further support they may need. Such discussions are important in building a collaborative approach and learning from each other. Over the Moon - Yoga Flash Mob! Join the Over the Moon community for a spectacular yoga flash mob at the Western Reserve! The flash mob will coincide with the Farmers’ Market and make for a wonderful family day out. Over the Moon teachers and friends of Over the Moon are teaching the sequence at CSSK as well as other schools and community groups leading up to the event. PLEASE NOTE: Over the Moon will not be responsible for children at the event. Please ensure your children are supervised. My name is Hetty Moysey and I am a past student of CSSK, and I am now in Year 11 at Castlemaine Secondary College . Recently I was asked to join a group of like minded young people on an Alpine Walk, an 11 day hike from Mittagundi to Wollangarra and I would love your help. Mittagundi is an Outdoor Education Centre and Pioneer-style farm created “with the belief that young people, mountains, purposeful work and challenges are natural partners”. I have been privileged over the past 2 years to take part in 4 Mittagundi programs and it is a massive part of my life so to receive an invitation to take part in the Alpine Walk is an absolute honour, and an amazing opportunity to grow as a young leader. For 11 days I will hike, winding through some of Victoria’s most rugged and remote high country, trekking over 130km through the beautiful Alpine National Park. This journey has two parts; the hike itself and the fundraising before the hike begins and this is what I would love your help with. To raise funds I have handmade packs of cards for sale which are located at the Office of CSSK. You can buy a pack of cards for $20 or a single card for $4 or leave a donation to support me. If you are interested in learning more about Mittagundi or this adventure you can email me on hettymoysey@gmail.com. With the return to school, many of us start thinking about what we might do for ourselves in the coming year. It’s not too late to enrol in any of our inspiring courses (full-time and part-time) in Rudolf Steiner Education which begin on Wednesday 14th February at 7.00 p.m.! 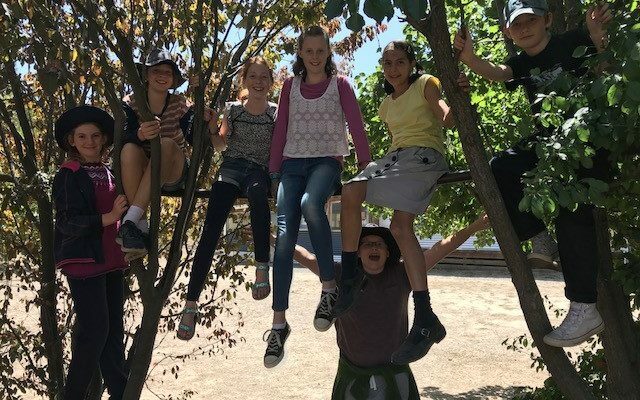 These courses are for everyone, including parents, prospective and practicing teachers and anyone seeking to develop their understanding of Rudolf Steiner Education. Part-time certificate courses. Each evening we have a movement or artistic activity, supper and then a lecture/discussion. The evening also offers an enjoyable social experience. These are non-accredited courses. Nourishing Early Childhood (Certificate), which explores the life of the very young child from 0-7. Duration: 1 year. Biodynamics (Note: this will be offered from 1100.am-3.00 p.m. on a Thursday, subject to numbers). Full-time accredited Steiner Teacher Training course: the Advanced Diploma in Rudolf Steiner Education (course code 10527NAT) (Tuesday to Thursday from 8.30 -4.00 p.m.) begins on Tuesday 13th February. Many students complete this course and go on to complete further tertiary study to become teachers, or undertake it for their own development and interest, or incorporate what they have learned to their own field of work in a range of settings. This is an accredited course, offering a rich and comprehensive grounding in the picture of the human being given by Rudolf Steiner in the first year, with a focus on the pedagogy and curriculum given in Steiner schools in the second year. VET Student Loans and Austudy are available for eligible students. This course offers a pathway to a Bachelor of Education at the Australian Catholic University, Deakin and Charles Darwin universities. Places are still available. A fantastic CSSK staff member is seeking a 3 bedroom house to rent for approx $250 per week, somewhere between Castlemaine and Bendigo for a family with a dog. For Sale - Double Bed futon with Base. Double Bed futon with base. Wool mattress with wooden base purchased at the Futon Factory. Purchased last year for spare bedroom but hasn’t been used. Great as a bed or couch. Mattress colour: light olive green. In Castlemaine for pick up or delivered. 14 Feb – bring a friend, two for the price of one!